The most frustrating part of the Everyday Messenger is that it is damn near perfect; not quite, but almost. The unique locking latch, a thoughtful strap, and quality construction make this bag a great everyday carry. 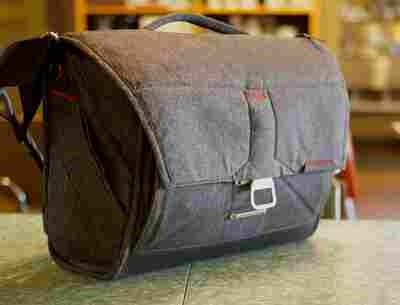 The Everyday Messenger is intended to be a photographers bag; with the main compartment set to house a camera and extra lenses. 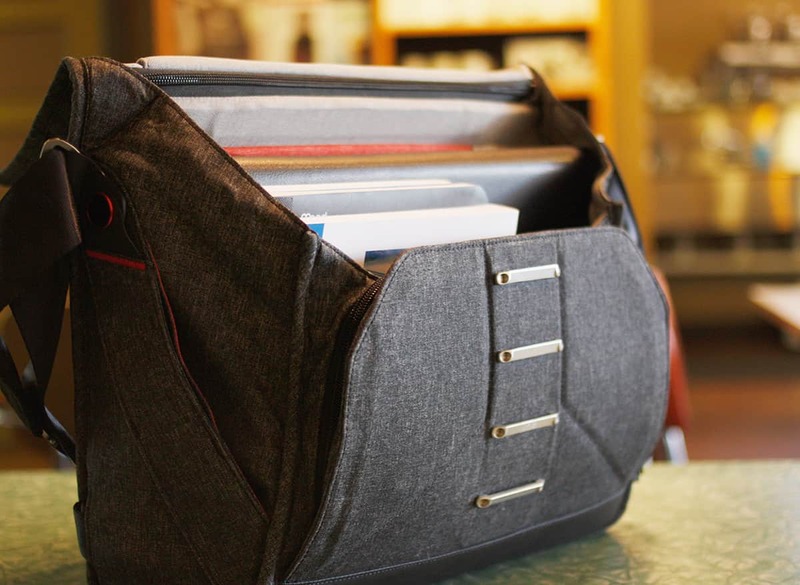 The bag is intended for carrying camera gear, but remove the padded dividers and it works for a laptop and “office” stuff. The Everyday Messenger is available in two colors, rust orange, or heather gray. Closed, the bag is minimal and unassuming. The grey is inoffensive with hints of stitching lines, diagonal and horizontal, across it’s back and main flap that exemplify it’s demure character; while sharp red stitching accents give it a punch of personality. The bag has a sturdiness to it; due in part to internal pieces of stiff plastic. This sturdiness is intended to create a safe space for cameras, but also affects the style greatly. It will not be mistaken for a floppy, simple canvas, messenger bag. When worn, and at rest, the Everyday Messenger keeps it’s form. There is one standout feature that could warrant a double take, the unique metal latch. It is a bright silver with a dull sheen, a little loop peaking out from behind the main flap. The latch itself is unique in appearance and in operation. 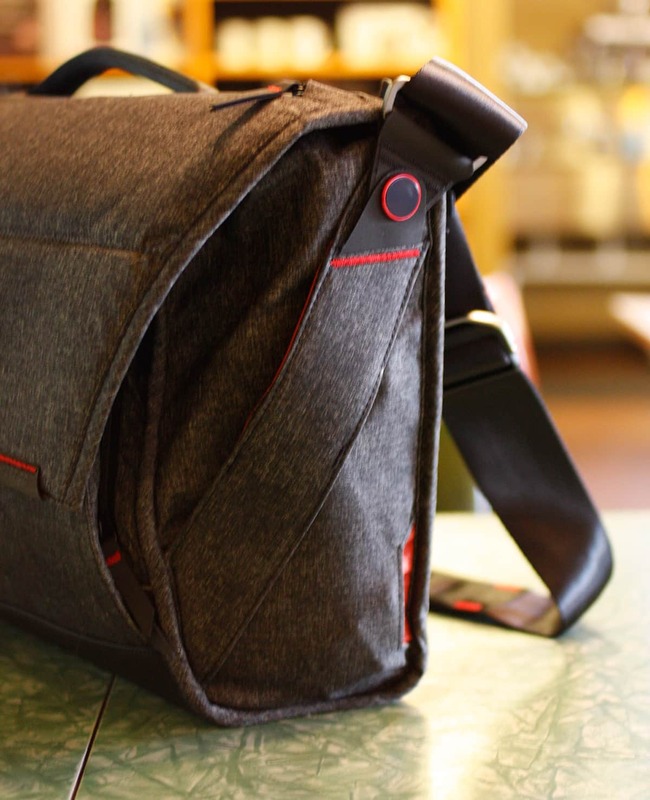 The Everyday Messenger has a few options not found on other bags. These features are what originally attracted my interest. It is not the same old standard hardware with a slightly different design. Nore is it just another photo messenger bag claiming to be special. Real thought was put into how this bag would be used. You can see in the videos that Peak Design has that created, that through several prototypes, they developed and iterated on features to make the Everyday Messenger something special. 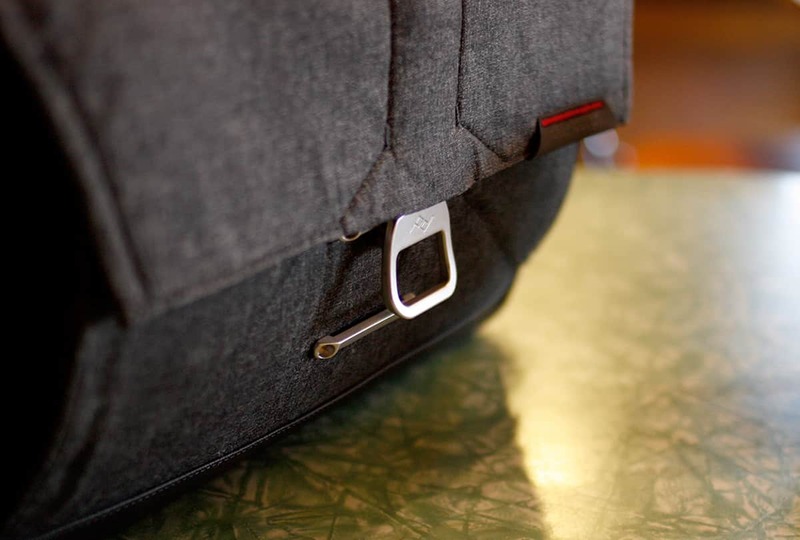 The first unique feature on this bag is the latch for the main compartment. The single metal latch is centered on the main flap, to which it is secured with a large piece of elastic. It latches closed by connecting to one of a series of crossbars on the front of the bag. The latch is make up of two pieces that work together to lock when attached to a crossbar. The crossbars are fixed to the front of the bag and look like rungs of a ladder all by themselves. 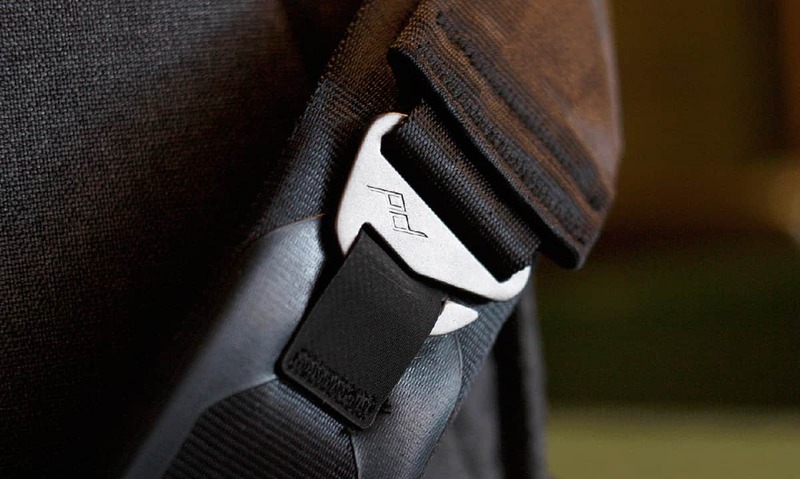 The elastic attached to the latch allows the main compartment to be filled, to varying degrees, and stretch to keep the main flap tight and secure. The latch is a nice piece of equipment. A great deal of thought was given to how a photographer would use this to get in and out of their bag. I would prefer if there were two closing latches, to better keep the contents of the bag tight and secure. But photographers often need to get into their bag using one hand, and the single latch facilitates that. For me two latches would give me comfort that the bag would be secure when walking through crowds and around to other people. Though the unusual way in which the latch opens offers protection from villainous pickpockets who may not be familiar with it’s particular mode of operation. The latch’s locking mechanisms catches the crossbar and snaps closed with a satisfying click. To open the bag you pull the latch out, which disengages the lock, then down to pull the latch off of the crossbar. When you are pulling down on the latch it is pulling against the elastic. One of the necessities of the peculiar way in which the latch works is that the crossbars are attached to a sturdy piece of metal in the front of the bag. This piece of metal, backed with sturdy plastic, gives the bag solid feel and allows for a magnet on the latch; that helps the main flap stay closed before the lock has engaged. I love this metal and plastic structure of the Everyday Messenger. The designers opted for four crossbars, to allow for the bag carrying cargo of varying size. Want to shove more stuff in, use the top most ladder rung. Running with only a couple of things, use the bottom latter. If the bag is just a bit full to reach one of the crossbars the elastic will give to enable the latch to reach. The elastic that is attached to the latch is nice, it helps when the bag is not exactly full enough for the latch to catch a crossbar rung. I am concerned about how long the elastic will last. I would prefer if the latch was attached using traditional nylon webbing that would be adjustable. With an adjustable strap one would have to adjust the strap to accommodate more or less cargo. That makes sense to me; the contents of my bag rarely change. 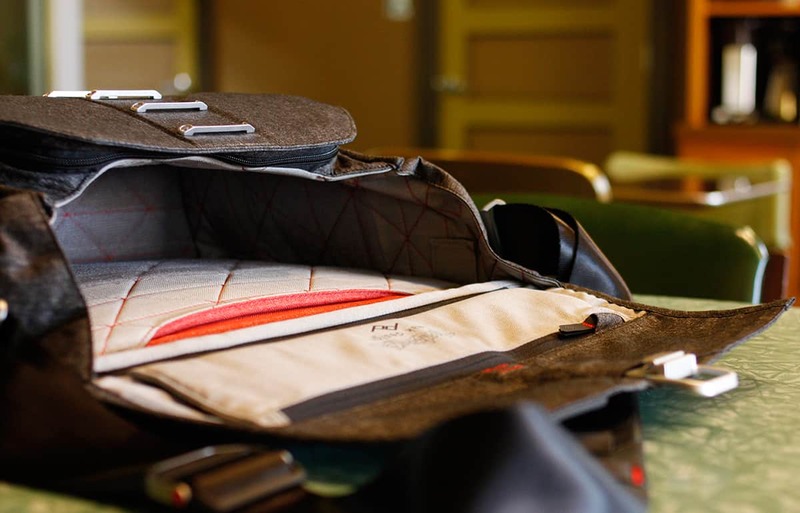 The main strap is made of a hollow tubed seat belt fabric, some sort of nylon, with padding inside the middle of the tube positioned to sit on the shoulder. 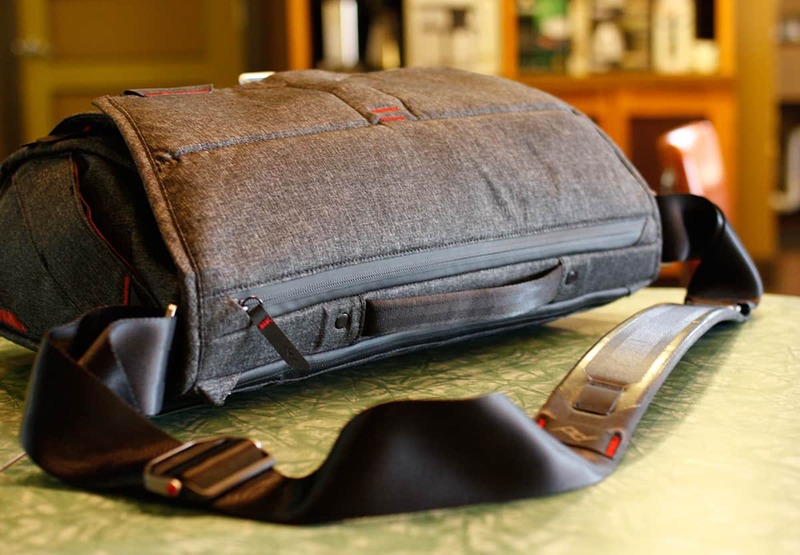 The strap is smooth, and glides across me when I have the bag across my body. It has an adjustable buckle on one end, and a G-buckle one the other. The G-buckle can be unhooked and re-hooked to one of two different anchors; which allows for a messenger style carry or shoulder bag style of carry. 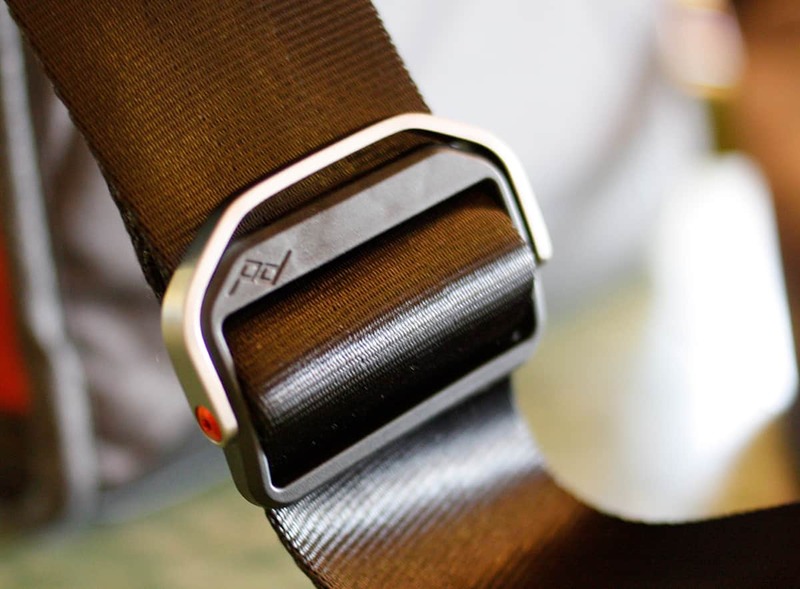 The buckle on the opposite end has a little handle which helps when quickly adjusting the length of the strap. I wear it cross body and use the buckle with handle to tighten and loosen. The messenger style is closer and higher to the body, the shoulder style hangs down longer. The strap connects to metal brackets which are connected to the bag using a pivoting attachment. The strap will pivot forward and backwards in two dimensions. One thing I detest about most bags is when their straps use a swivel clip connected to a d-ring or a triangle attachment on the bag. The swivel clip moves in 360 degrees, and twists and turns in all directions. When I use one of these straps it is always getting turned around. I hate it so much. It is so annoying to grab my bag and sling it on, only to have to spend time untwisting the strap. Which is why I like straps that are sewn directly to the bag, or connected by wide brackets and straps that do not swivel. They are far easier to manager. Before I got the Everyday Messenger I was concerned that this two dimensional pivot would be another easily tangled strap. That it would be a hassle; an annoying distraction taking time and energy from my day. The reality is a strap that is joy to use. The pivot improves on the swivel clip; having the benefit of naturally shifting to the best position without tangling and contorting. When I pull the strap tight and the bag rides high on my back, the pivot allows a steeper angle. When I loosen the slack and the bag lays at my side the pivot angle opens up. The pivot attachment is really a great feature. The Everyday Messenger has three compartments. The large main compartment making up the bulk of the bag, a laptop pocket in the rear, and a small utility compartment in front of the main compartment. The main compartment is large. It has a flat bottom about four inches deep and 16 inches wide. The sides are soft velcro where the dividers attache. Here I store my personal 15” laptop, the power brick, a couple of notebooks, a paperback book, my kindle, and a case for my headphones. This compartment has an accordion feel to it; where it is able to open more or close tightly depending on which crossbar you latch onto. Expanding when open makes it easy to reach everything inside. 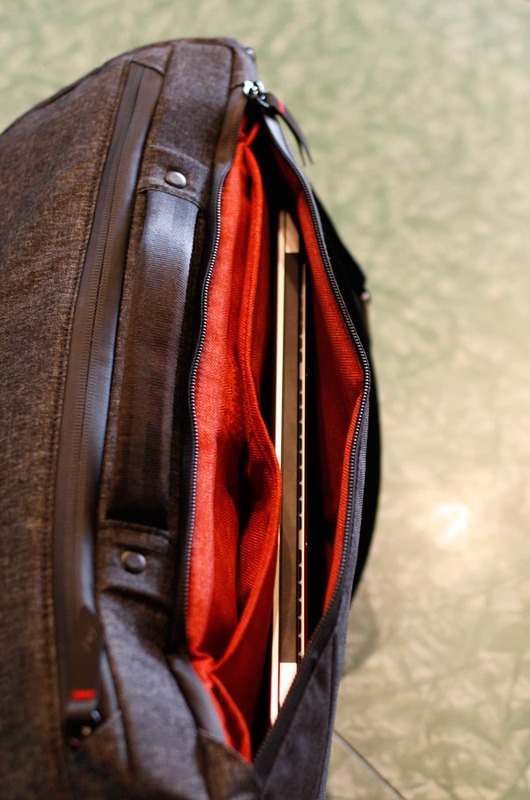 The laptop pocket is behind the main compartment, and close to the body; it leaves a little to be desired. I have a natural distrust of “laptop compartments” in bags. Often they are poorly padded, and close to the ground. One wrong drop could be all it takes for a dent to find it’s way onto my laptop. Because of this I always carry my laptop in it’s own case. Unfortunately the laptop pocket barely fits a naked 15” laptop itself, and it is not even close to fitting one with a case; even a slim padded case. Though it might fit one of those hard shell cases. I end up keeping my laptop in the main compartment. Now I also carry a work laptop, a smaller 13”, which does fit nicely into the laptop pocket; it is still a bit tight but it does fit. The front utility compartment is meant for cords, whatnots, and nicknacks. It has several pockets made of stretchy cloth, which expand to accommodate large items; a very nice touch. However these pockets are just a little bit too small. The largest pocket will fit my small notebook, but just barley, and the top sticks out a little more than I would like. These are nice pockets, but they do not offer a huge amount of space for the things I carry. I could not fit my Mac’s power brick inside the utility compartment with anything else at all. I ended up putting a couple of USB chargers. They fit, but have to be offset or they are too thick. The size of the pockets are good and bad. I do not want to carry a bunch of stuff, but if it were just a bit larger it would be just a bit nicer. Outside the bag there are small vertical pockets on each side, nicely sized for chapstick, but once again, a tight fit. They have a diagonal opening, and are easy to get into when wearing the bag. Below each of these two pockets are another smaller, hide away pocket, one on each side which house the waist straps. The waist strap can also work as a three point harness. I think these pockets are a waste. 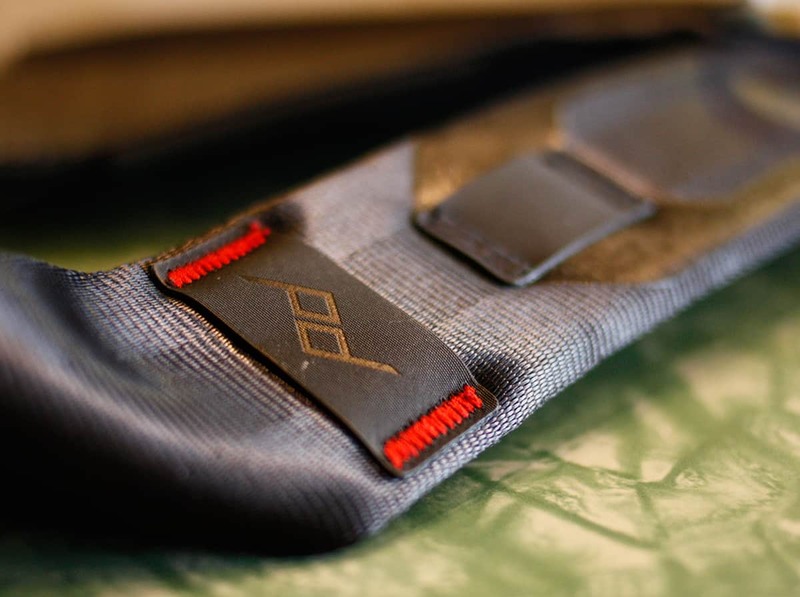 The strap with a metal bracket end are sewn into the pocket. The strap and the bracket can not be removed, but the attached strap can. Even when the attached strap is removed the pocket is bulky and pushes in on the vertical side pocket. I like the designer’s idea of a pocket where the waste belt could be hidden, but the execution is too complex. Having nylon loops which a strap could be attached to would be better. 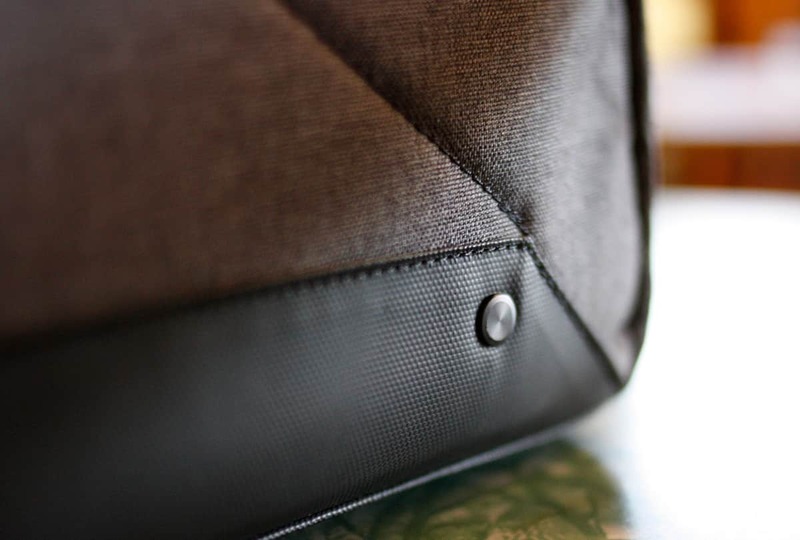 The strap and metal bracket could be removed and put inside the bag’s front pocket, out of the way. Leaving the loop to be unobtrusive. One thing that I do not care for is the top zipper on the main flap, it gives “quick access” to the main compartment. 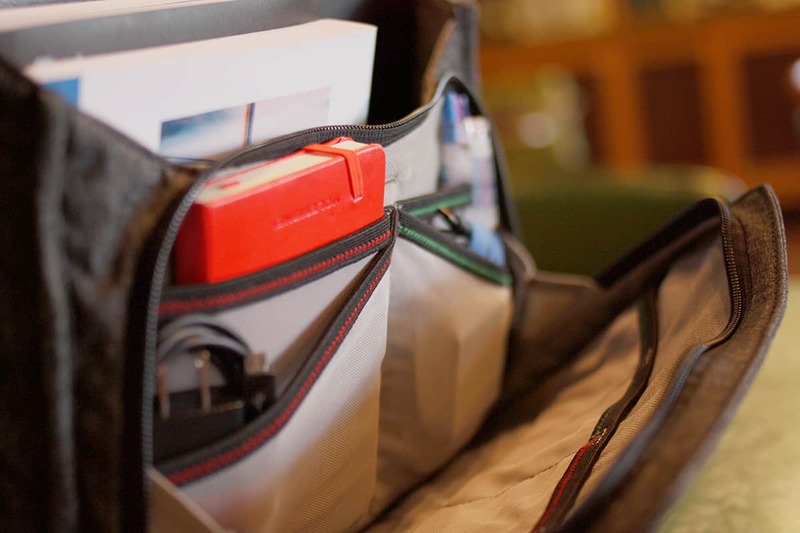 I do not want quick access to the main compartment; that’s one of the reasons why I like messenger style bags, they make it take a few extra steps to get into the main compartment. For me this adds to security. But the top zipper is a feature seen on almost all camera bags. For a photographer I can understand the need for quick access, but the single latch makes it easy to get into the bag, the top zipper is just overkill. Lastly there is a wide thin zippered pocket on the inside top flap. A pocket that would look to be perfect for my Moleskine notebook, but no, it doesn’t fit. The pocket is about a quarter of an inch too small. This is a theme with all of the pockets in this bag, just about half an inch too small. The strap is nice and soft. The built-in padding makes it comfortable while also making it convenient. There is no “pad” to slip and slide around while I and putting the bag on and taking it off. The bag is not very heavy, it is reasonable given the metal hardware. The bag is not huge, a plus for me; as I tend to fill every bag to it’s absolute limit. So a smaller bag will be better for me in the long run. I wear the bag cross-body, and pull it tight; which is made easier by the small handle on the adjustable strap bracket. At first I thought this was a locking handle, but it is just a tool to be used to adjust the strap length. The handle is helpful, but not fully necessary; the strap is so slick that it is easy to adjust the length without using the handle. Messenger bags and top handles are sworn enemies. The asymmetrical nature of a messenger bag means it’s hard to find a point to be a sturdy foundation which to mount a handle. Most messenger bags with handles have them near the back, and when held end up being lopsided. I think Peak has done a good job with their top handle. It is reinforced, like the front crossbars, with a stiff metal and plastic. The handle itself is not top center, so you would think holding it would be lopsided, but is is not. A feat of design I think can be attributed to the overall shape of the bag that evenly distributes the weight. The handle makes it easy to maneuver the bag in odd situations; like when I am getting in and out of my car, sitting down in coffee shop booths, or pulling the bag around me so I can get into the main compartment. The quality of the bag is second to none. Thoughtfulness and craftsmanship that went into it’s design and construction. It is a breath of fresh air to find a bag that was crafted with care and planning. Not just thrown together by whatever was sitting around. I bought this bag because of that thoughtfulness. There are a few quirks I dislike, but the overall quality more than makes up for them. Go buy an Everyday Messenger, you will not regret it.